The importance of the essay is recognized by both Robert McAfee Brown and Elizabeth Niebuhr Sifton choosing to place the essay first in their selections of essays. Brown chose to place it first in his The Essential Reinhold Niebuhr and Elizabeth Sifton chose it to be in first place in her ‘Sermons and Lectures on Faith and Belief’ section of her Reinhold Niebuhr volume for The American Library volume of essays. The essay corrects the impression held by many of his contemporaries that Niebuhr’s pessimism undercut the Christian imperative for social-political action. It is important to add to their notations correctly assigning the lectures to the 1934 Ware Lectures before the Unitarian Universalist Association and to the much later publication in Christianity and Power Politics in 1940. Niebuhr also published it in The Christian Leader and The Christian Register in 1934 to answer the critics of Moral Man and Immoral Society by Christian liberals and socialists who felt his 1932 volume had been too pessimistic. That volume had caused a storm of protest and the publication of the lectures in 1934 partially met the criticisms. He no longer appealed to illusions to fortify social action, but to the depths of the Christian faith which he was now rapidly appropriating in his writing. He now wrote from a perspective of penultimate pessimism and ultimate optimism. Robert McAfee Brown’s coining of his perspective as a pessimistic optimist is close to correct, but the distinguishing of the two levels of thought in the dialectic is necessary. The third element which I suspect was driving both Brown and Sifton was the concern to connect his perspective with supporting relentless action. His writing, organizing, lobbying, teaching, preaching all were dedicated to the relevance of ultimate perspectives supporting social action for the common good. He explicitly in his last book Man’s Nature and His Communities disavowed the use of his Christian Realism’s support for defense of unjust privilege. The 1934 context is helpful. Niebuhr had just assisted Paul Tillich in escaping from Nazism. In several essays he was analyzing Nazism and the divisions within the party. Niebuhr’s realism informed by Marxism was encouraging the young Turks ‘revolt in the Socialist Party. That same realism was causing strife in the editorial board of The World Tomorrow which would close publication the same year. 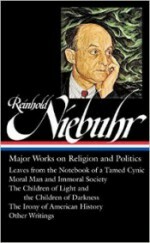 Niebuhr was moving left politically and right theologically. The Fellowship of Reconciliation was also in turmoil. Niebuhr resigned his membership and Vice-Presidential leadership over the philosophy expressed in these essays. His ultimate optimism of a vision of peace was compromised by the need for force in industrial-labor-political strife. The achievement of good in society required less than absolutely moral means which in term would be criticized by absolute perspectives. Both the absolute and the relative could be preserved by recognizing they operated dialectically, but on different levels. If Moral Man and Immoral Society is understood as the reflections of a good man recognizing that the achievement of a more just society depended upon less than absolutely perfect means, the dialectic between absolute meaning and relatively just means could be grasped. Here such an understanding is defended within his own field of religious ethics in a manner his other publication outlets, The Nation, The Christian Century, and The World Tomorrow, did not fit. It would fit in his 1940 collection of pro-Christian intervention in Christianity and Power Politics. The two essays’ contributions remain a permanent part of his perspective whereas the book written a year earlier, but published in 1934, Reflections on the End of an Era, he disavowed to me in a letter shortly before he died. His 1956 Preface to An Interpretation of Christian Ethics also indicated that his perspective had changed from that 1935 interpretation. The continuity of these essays with his later thought has earned them the primacy attributed to them in the previous cited selections. He found modern religion over emphasizing either evolutionary nature or the rise of the human spirit. Neither naturalism nor humanism corresponded adequately to the chaos of the present social life. They both tended by avoiding the reality of evil in human affairs to fall into despair and ineffectiveness. Their optimism betrayed them in the present crisis. Both Communism and Nazism fell back into a religion of tribalism in which salvation was to come from either the proletarian class or the Aryan race. They would both fall into despair. Both expressed demonic pretensions by elevating a particular group as the bearer of meaning. In a religious understanding they were modern forms of totemism. If liberalism based on either nature or the human rationality could not deal with the present and the alternatives of Communism and Fascism were bound to break under their exaltation of a particular group, another alternative was needed. [An adequate religion] will nerve men to exhaust all their resources in building a better world, in overcoming human strife, in mitigating the fury of man’s injustice to man, and in establishing a society in which some minimal security for all can be found (722). In fact there was always a devil in classical religious mythology…this realism is always balanced by an ultimate optimism, because it is never believed that the devil can seriously threaten the will of God (722).